I am Etchells sailor and I know the history of the boat in the races (Kiel and Travemunde). I am very glad to know Kobold XXI° to sail still. I have find it for many years, I suspected Kobold XXI° was measured as 5.5. This boat has a unique history, as she was originally built as a contender to become the new 3-man keelboat for the 1972 Olympics. 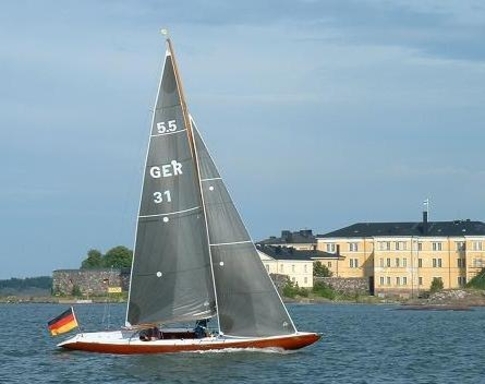 Constructed and built by Willy Lehmann (East Germany) for the President of the German Sailing Federation (DSV, West Germany) "Kobold" was raced in the 1966 + 1967 elimination regattas in Travemünde and Kiel, against boats constructed by Linge, Etchells, Chance jr. and others. After the "Soling" had been chosen, "Kobold" was changed slightly in weight to meet the 5.5m rules and was since then sailed as a 5.5m.